Overflowing with chocolate creations, this snowy and glistening five-box tower arrives tied with a satin ribbon, ready to delight. Inside, enjoy Lindt truffles, chocolate bourbon caramels, Ghirardelli squares and even chocolate almond jewels. 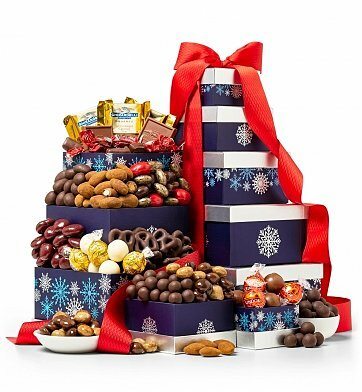 Chocolate Cheer Tower is a hand delivered gift. These gifts are delivered by one of our local design centers located throughout the United States and Canada. Same day delivery is available for most gifts when ordered before the cutoff time. The cutoff time for Chocolate Cheer Tower is in the recipient's time zone. Dark Chocolate PretzelsSmooth dark chocolate enrobes crisp, buttery pretzels for a perfectly delicious delight.